History of Nova Scotia; Book.2; Part 5; Ch. 10. "The Guerrière and the Constitution." Ch. 10 - The Guerrière and the Constitution. It was the 19th of August, 1812, and Captain Isaac Hull (1773-1843) was on the quarterdeck of the 44-gun, USS Constitution.1 In a soft confidential voice he told his first officer that maybe now they could go along a little easier and have some of the men stand down. It had been a long chase but they had outrun a British squadron. The Constitution now had the clear light of day and there was no sign of a British sail. The day before things were not looking so good as a fleet of British ships were in hot pursuit. Was it the pitch black moonless night that had saved them? Maybe their superior sailing abilities? She was, as her name suggests, a French warship. She was taken by the British in 1806 and re-fitted out at Chatham. John Liddell -- the journal-keeping merchant at Halifax to whom we have referred in this part on a number of occasions -- made a note of her on July 5th, in 1810, "HMS Guerrière comes in from cruise." And on November 9th, "HMS Guerrière go on a cruise." Through the years 1811-1812, she continued to work out of the Halifax and Bermuda stations. 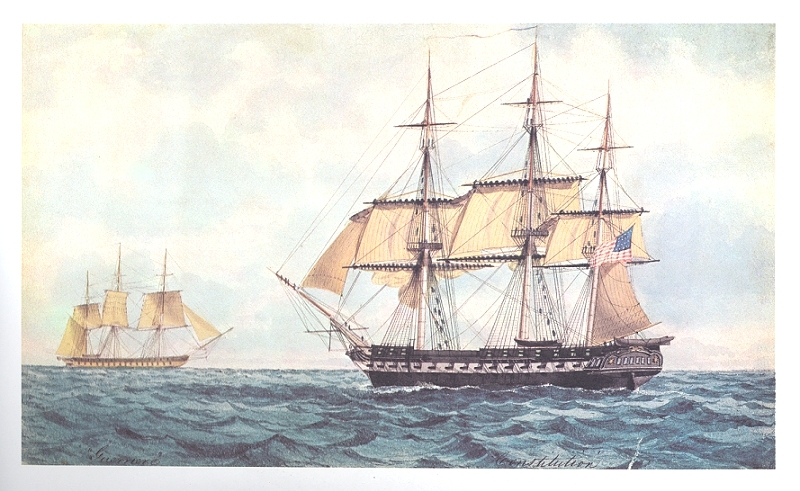 In 1811, (April 11th) she had received a new captain, the twenty-three year old, James Richard Dacres.3 On the day that the Constitution spied her, August 19th, 1812, the Guerrière was "600 miles S.E. of Halifax"4 making her way along in a fresh breeze. She and her crew of 263 were headed for Halifax where she was going to undergo a refit. It was early morning when the ships came in sight of one another, but it was 3:30 P.M. before each knew who they were dealing with. Both cleared for action5, and by 4:30 P.M.
A Copy of a Watercolor by W.A.K. Martin. The Guerrière, her shots not finding their targets, resorted to sailing out of trouble. Within the half hour she switched her course coming about stern-first through the wind, desperately trying to position herself and, above all, trying to avoid being raked, that is, receiving a broadside from her adversary that carried along the length of her. She did all she could to avoid having her bow or her stern pointing to the thick broadside of the Constitution. Soon, however both ships were running side by side and brought "to close action." In short order the Guerrière's mizzenmast7 was completely cut through by shot. The rigging lines kept the mizzen attached to the Guerrière, with the works (lines, spars, torn sails, flags, etc.) bent over from the side of the Guerrière. The works dragged in the water along side of her, with the lines tangling the tillerless rudder. The Guerrière headed unmanageably off course into the wind and slowed; the Constitution lost no time in positioning herself on the bow of the British ship and raked her. Painted by T. Birch and engraved by Kimberly. With the dead and the dying lying on their decks, the Constitution and the Guerrière continued their destructive dance. The combatants dropped clear of each other. The Guerrière fired her cannons once again but her cannonballs were of no effect, wadding from her cannons did more damage as a small fire erupted on the Constitution's deck, presumably put out quickly by the bucket brigade. Painted by Montardier du Havre and engraved by Baugean. With every stick standing, the Constitution wore round and positioned herself within a pistol-shot of the starboard quarter of the Guerrière. The Constitution made ready to administer the coup de grace. Her gun crews stood still, the lead hand looking to the gunnery officer. A period of almost absolute quiet followed. The crews of both ships waited. Rolling heavily, her gunports admitting waves of water, the Guerrière was in a defenceless state. Captain Dacres called his remaining officers together. A decision was taken to strike their colours. A lee gun was fired, and the union-jack hauled down from the stump of the mizzenmast. Painted by J.J. Barralet and engraved by B. Tanner. 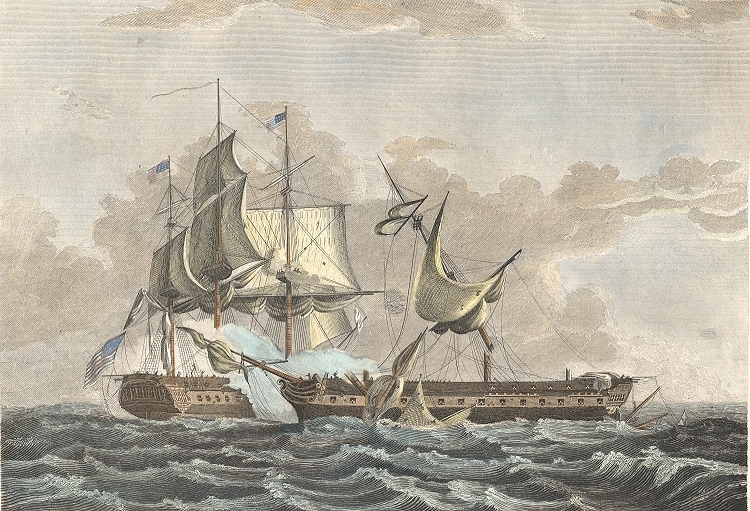 A reasonable conclusion is this: The Guerrière was destroyed by the Constitution, likely because the guns of the Constitution simply had better range and did more damage to the Guerrière, so that, minutes later, when the ships were fighting side by side, "yardarm to yardarm," (close-in fighting was always what the British navy strove for), a good part of her was already shot away. Simply put, the Constitution had greater strength and better resistance. 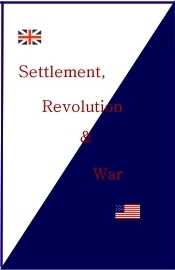 We have now written of the American successes: the battering of the Little Belt by the President in 1811, the American Fleet chasing the Belvidera in June of 1812, and the capture and burning of the Guerrière in August of 1812. There were other American successes not so close to home to which I shall now but briefly refer. 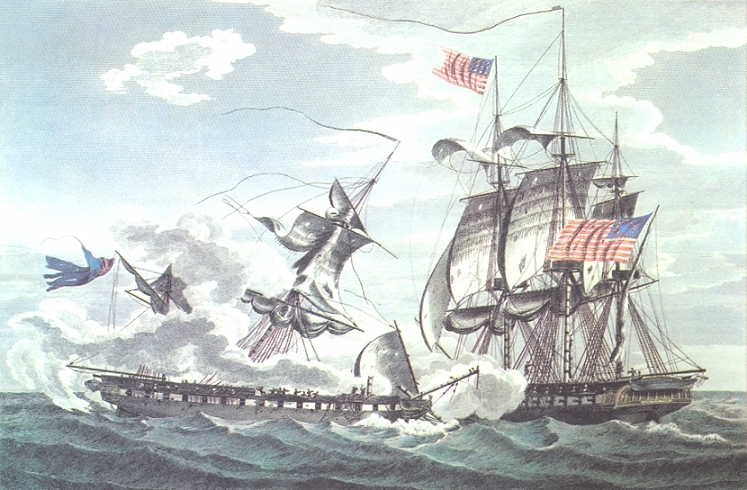 Then there was the encounter between HMS Peacock and the USS Hornet towards the end of February, 1813. The 20-gun USS Hornet had been ordered to cruise the waters northeast of South America. Information had come to her captain, James Lawrence (we will be reading about him soon again), that tucked in the mouth of the Demarara River (Guiana) there was lying a British warship of about equal size, the Espiègle. The Hornet was keen to take her. But first it was necessary to clear Cape Caroband. The Hornet was hard on the wind in trying to clear Cape Caroband. It's hard sailing against the wind, -- in fact, a sailing vessel cannot directly do so. The crew is obliged to make the sailing vessel zigzag, back and forth, back and forth, and, every time, the sailors must pull on ropes hand over hand. When sailing to windward a sailor, with each new tack, must reset all lines and adjust all sails -- it's hard work. The men of the Hornet need not have worked so hard, for as soon as the Hornet rounded the Cape there came a British man-o'-war, she was aiming right for them. It seems the Espiègle had company at her anchorage, the Peacock, another 18 gun brig.17 The captain of the Peacock, Captain William Peake was meaning to deal with the Hornet. 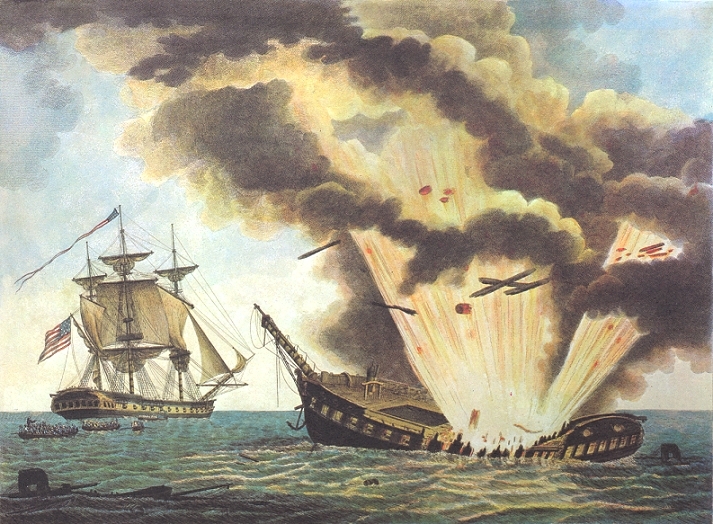 Admiral Mahan wrote, the "capture of the Peacock was the last of five naval duels, three between frigates and two between sloops, all favorable in issue to the United States ..."22 Things were due for a change.